The luxury resort of Lemuria in the Seychelles derives its name from a mythical “lost land” of the same name that was meant to exist somewhere in the Indian Ocean. Over a hundred suites and villas are laid out along the shoreline of the property between Small Kerlan Cove and Grand Kerlan Cove with the golf course located immediately behind. Rodney Wright, who for many years was part of a successful partnership with Robin Nelson, working on Pacific projects, constructed this golfing paradise along with Marc Antoine Farry, the former European Tour professional and the 6,105-yard, par 70 Lemuria opened for play in 2000. The opening twelve holes are routed over relatively flat terrain where the palm-fringed fairways flirt with water hazards on a number of occasions. The final six holes rise and fall over a densely wooded hilly landscape that contains the signature hole on the scorecard; the short par three 15th, where the golf ball drops over 150 feet from tee to green below. There's a lot of wow associated with this course and it's not all just the signature par 3 15th. If you're playing golf here, it's more likely that you're staying on site at the high end Constance Lemuria resort where rooms are upwards of EUR500 per night (and where the golf is included for free), so the golf is probably an afterthought, or as I did as an outside guest in which case there's a rather steep green fee that probably deters most. So I expected a fairly average resort course that didn't receive many players and looked nice but didn't really cut it as a total golfing experience. I'm happy to admit I was wrong and that along with the spectacular views, there's quite a fine golf course. The design was interesting, with plenty of risk/reward options (water carries and shaping shots around dog-legs are very necessary to attack the course and for better scoring options), as well as an overall well conditioned course, including true running (but a little slow), contoured greens. As the course is quite short in overall length I played from the back tees, even though the back tee markers were usually positioned well forward with the more friendly resort tees. About half way the course marshall asked me to stop playing from those tees as they're being 'prepared' for a tournament, (a quick Google reveals the Euro tour old boys will be here in three weeks) but from the more forward tees the course becomes a much easier resort course and felt much diminished. But the aesthetics of playing golf here are really the star attraction, on an island that bills itself as paradise. It's tropically warm (for which the included bottles of iced water are a necessity), there's mangrove hazards, the typical Seychelles granite boulders as feature points and of course the holes 13-18 which feature dramatic elevation changes. A wonderful and memorable closing to the game. The facilities are classy as expected and staff friendly and helpful. If you find yourself on Praslin for any reason, (and you're reading this website so clearly you're already a golf nut) hang the expense and get a game here. 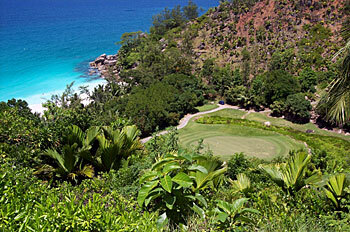 In a few days I'll be able to contrast this resort course with the other course in the Seychelles on the main island of Mahe: the Seychelles GC which looks like a much more modest 9-hole course and local-players oriented experience. J ai joué à plusieurs reprises sur ce golf. Il est magnifique esthétiquement parlant et complet sur le plan technique! Les fairway sont souples comme de la moquette et les greens impeccables. La seconde partie à partir du 13 est à couper le souffle au sens propre comme au figuré et la voiturette est la bienvenue! Arrivés au 15 et au 18 il sera temps de sortir l appareil photo car les vues sont superbes! Si vous jouez en fin de soirée vous aurez l occasion d assister à l envol des roussettes partant dîner ! Moment Unique! Vraiment un bon moment à partager sur ce parcours relativement court avec ces 5000m au départ des jaunes, mais truffés de pièges à eau! I played this course several times. It is aesthetically beautiful and technically complete! The fairways are soft as carpet and the greens immaculate. The second half from 13 is breathtaking both literally as figuratively and a cart is welcome! When you arrive at 15 and at 18 it's time to get out the camera because the views are stunning! If you play late at night you will have the opportunity to watch the flight of bats leaving for dinner! A unique moment! Really a good time to share this course which at 5000m is relatively short from the yellows, but riddled with water hazards! I played the course whilst on honeymoon in June 2012 and I really enjoyed playing there. The course was in great shape and proved to be a really good test. The scenery is absolutely amazing and can sometime distract you concentrating on your golf game. The 15th and 18th holes are my favorite as they are unlike any other holes I have played before. Wonderful experience, would highly recommend a visit! I played the course in November 2009 and it is a very nice course. The landscape is really breathtaking! Hole 15 is just amazing: players will be awed by the magnificent scenic views from the tees perched high up to the rocky ridge. From the men's tee the hole plays an astonishing 60yds drop to the green lying in the valley below. The beautiful white sand of Anse Georgette (btw, one of the best beaches in the world according to wikipedia) and the crystal blue waters lie adjacent to the left across a small mangrove marsh. Holes 1-12 play very different from holes 13-18. The first twelve holes are typical parkland style, whereas holes 13-18 are very hilly. Unfortunately, the greens and the bunkers are in quite bad shape. The staff is very friendly. The course is quite short (just over 6000 yds from the Champ Tees), but difficult and a real challenge.